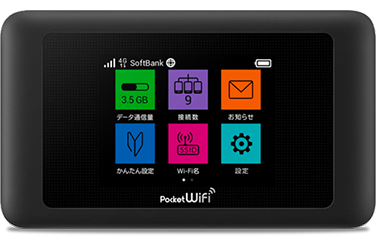 You will be able to use the Internet in Japan by connecting your PC or smartphone to the Wi-Fi router. 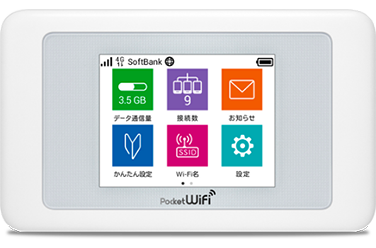 By using the portable Wi-Fi router, you can use the Internet in most places in Japan. It is so simple to connect, that even first-time users can use it easily. All you need to do is order from our online store, and we will deliver the Wi-Fi router to the airport or your hotel. 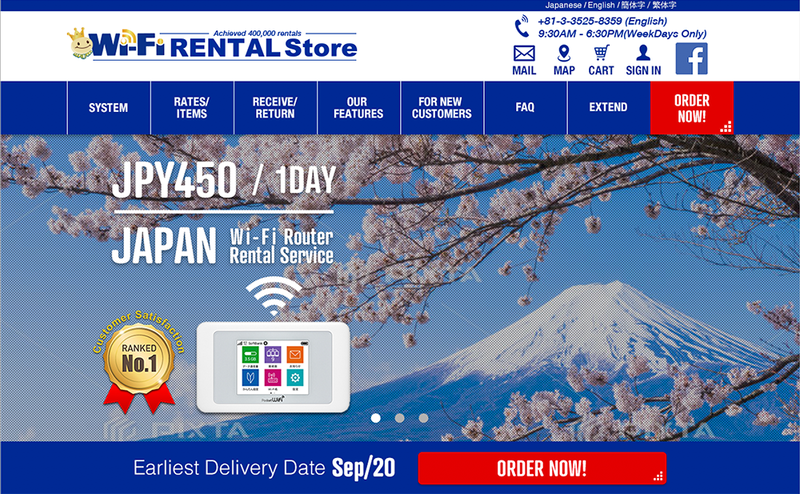 Many travelers and business people visiting Japan rent Wi-Fi routers. We have rented over 500,000 devices. Wi-Fi routers are indispensable for traveling in Japan. You will be able to access the Internet by connecting your PC or smartphone to the Wi-Fi router. You will be able to use the Internet as you do always, such as make Google searches, or post on Facebook or Instagram. All our Wi-Fi routers use the LTE network, so you will have stress-free, high-speed access to the Internet. We also have Wi-Fi routers that allow high-volume data transfer, suitable for viewing videos. Connecting with the Wi-Fi router is very easy. Simply turning on the Wi-Fi router will emit Wi-Fi signals. Just select the Wi-Fi device from your smartphone or PC to connect. You just need to set the password once. Our Wi-Fi routers can be used in most places in Japan. (There are some exceptions, such as basement floors, tunnels, some isolated islands, or some mountainous areas). It may also be used while in transit. For example, you can search about your destination on your smartphone while you are on the way, on a bus or taxi. You can also check information about a shop you discovered in town, or send a beautiful picture you just took of the sights to your friends. You can connect up to 10 or 14 devices, including smartphones and PCs with 1 Wi-Fi router. Your speed may not be affected by 2-3 devices, but may slow down if you use many devices at the same time. If you are traveling with friends or family, you can all connect to one Wi-Fi router. (The range of Wi-Fi signal is about 10 meters.) Everyone staying in the same room can connect to the same device too. You only need one device, so it can be very economical to share. You can order your Wi-Fi router in our website. Click on the "Order" button on this page. You can choose the delivery location and rental start date from the order screen. Please make your payment on the last page. When your order is complete, we will send a confirmation email to your specified e-mail address. We offer 3 types of Wi-Fi routers. The models vary in specifications, but the following 3 are the key differences. Take a look at the 3 major differences, and select the one best for you. The service area varies depending on the Wi-Fi model. If you plan on traveling to mountainous areas or to isolated islands, we recommend the au KDDI router.See the service area maps by clicking below (In Japanese). The data allowance varies depending on the Wi-Fi model. Once you reach your limit, the transmission may stop or become slowed. For the further detail, please click here. Watching a 1hr video on a smartphone will use approximately 1GB. For further details, click here. *The transmission allowance is by month. It will be reset on the 1st of every month. You may use up to the same data volume the following month. *Please be assured that even if you rent at the middle of the month, you will be given a device with an ensured data volume left. * For short rental periods not exceeding one month, you still may use the full data allocation. E-mail & Internet browsing does not use much data. However, please be careful that viewing video consumes large volumes of data. The maximum speed differs by model. The indicated values are the maximum theoretical speeds, so may differ from actual speeds. There may not be too much difference between models if you will be browsing the Internet. 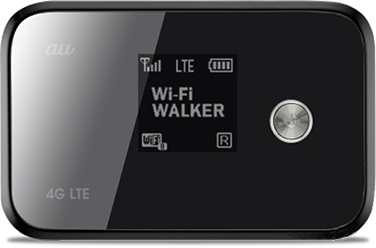 Since all our devices use the LTE network, they are faster among portable Wi-Fi routers. Besides renting a Wi-Fi device, there are many ways to connect to the Internet in Japan. The following are other comparisons between Wi-Fi rental and other connectivity options. By inserting a purchased SIM card into your smartphone, you will be able to call and connect to the Internet. If you would like to make calls, purchasing a SIM card might be the best option. However, you will need to modify the APN on your smartphone after inserting the SIM card. This may be a little technical for those who are not knowledgeable with smartphones. As compared to a Wi-Fi rental, there is less allowed data volume. There are some types of SIM cards that allow 30GB / month, but can be quite costly. For those who would like to make calls but have limited need for Internet use may find purchasing a SIM card to be convenient. SIM cards can be purchased at airports in Japan or electronic shops. Global roaming allows you to access the Internet in Japan using your own smartphone and current carrier from your home country. It is very convenient since you only need to perform a few steps on your smartphone, but the daily allowed data volume is small, and can be very expensive. This option is recommended for emergencies or for short term use. It is not recommended for longer use as it can become very costly. Your contacts can call you with your usual number, so that you don't miss any important calls, but you may be charged with expensive roaming costs for both incoming and outgoing calls. In terms of ease of use, global roaming is the most convenient. However, as mentioned above, global roaming is very expensive. Considering costs, Wi-Fi rentals are recommended. Combining a Wi-Fi rental for Internet use and global roaming for calls might also be a good way to combine convenience with cost. Many stations and airports in Japan have free Wi-Fi spots. If you will be limiting your Internet use to stations and airports, using these free Wi-Fi spots may be the most economical. There are not too many free Wi-Fi spots available, and even less outside the major cities. If you would like to access the Internet everywhere -- whether out in town, on the go, or where you are staying, the Wi-Fi router rental will be more convenient. You can access the Internet by contracting with a local network provider to use smartphones or Wi-Fi routers. The contracts are usually for 2-3 years, and do not suit short-term use. You will also need to purchase a smartphone or Wi-Fi router provided by the carrier. If you plan to use the device for the duration of the contract, it will be more economical than renting our Wi-Fi routers. However, as there are penalties for cancelling your contract, it would be cheaper to rent Wi-Fi devices if you will be using it for less than a year.